Have a Cinco de Mayo party coming up. Did you just use the vanilla cupcake recipe? You could just use a vanilla cupcake recipe. 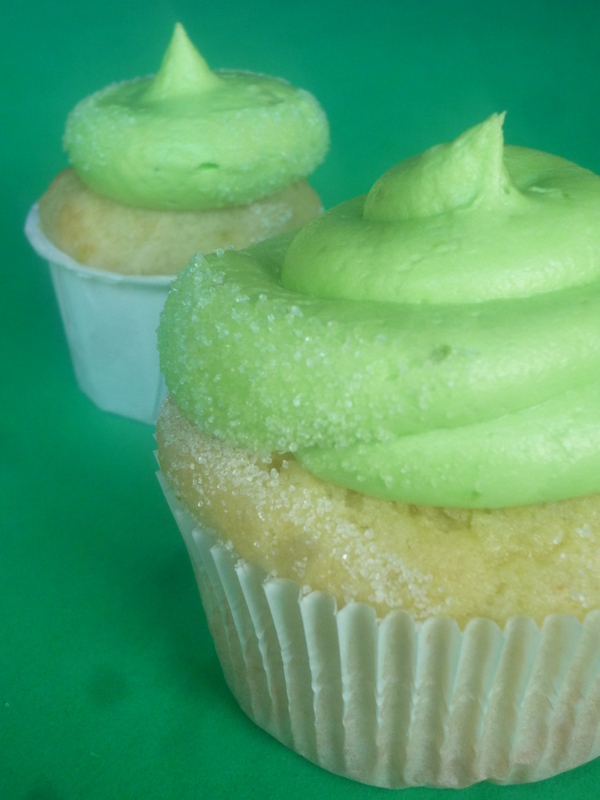 However, I used my favorite lime cupcake (basically just a vanilla cake with some lime zest and lime juice). I’m confused. You say you can’t have margaritas at your work so you brought these in. The recipe is for the buttercream frosting and you say “Tequila baked in”. Am I missing something? You don’t bake buttercream frosting so the tequila is still alcholic? I know it’s only two tbs over the entire recipe but can something be substituted for the tequila? I did add 2 tablespoons of tequila to the buttercream and a little tequila to the cupcake batter (2 tablespoons). If you didn’t want to use tequila, you wouldn’t have to! It would just taste like lime (or a virgin margarita). I would add extra lime juice or milk to your frosting to make it the right consistency if you omit the tequila. It’s your choice! I do have a recipe, but it’s my go-to recipe for cupcakes that I am currently selling. I had better not post it 🙂 Sorry!! If you have a good vanilla cupcake that you like, just add about 2 tablespoons of lime juice and one tablespoon of lime zest. How much are you selling your cake recipe for? I have a good vanilla cake but like to try new things too! Sorry, but my recipe isn’t for sale. You can use your vanilla cake and add some lime/lemon juice and tequila to the batter with your liquid. Then top it with my tequila buttercream recipe! It should be delicious! How do you make the cupcakes? The frosting sounds yummy. Is the cake made a certain way? How many cupcakes does this recipe ice? It really depends on how much frosting you put on each cupcake. I would say it frosts between 12 and 18 cupcakes… That’s with a decent amount of frosting on each! I make this frosting and put it on Betty Crockers Lemon cake… and it was a HUGE hit 🙂 The frosting is so good! I used Patrón – YUM! Pinned your image and recipe so I could easily post it on my page about finding ideas for Cinco de Mayo on Pinterest. Let me know if you do not approve of the use.